SAN FRANCISCO — The Bay Area Day of Remembrance 2013, commemorating the World War II imprisonment of the Japanese American community, will be held on Sunday, Feb. 17, from 2 to 4 p.m. at the Sundance Kabuki Cinemas, 1881 Post St. (at Fillmore) in San Francisco Japantown. This year’s theme: “The Civil Liberties Act of 1988: Readdressing Redress 25 Years Later.” It was on Aug. 10, 1988 that President Ronald Reagan signed legislation that authorized individual payments to those impacted by Executive Order 9066, a formal apology from the government, and a public education fund. The event is dedicated to the memory of Sen. Daniel Inouye (D-Hawaii), who passed away in December. • Jana Katsuyama, KTVU Channel 2 reporter (emcee). 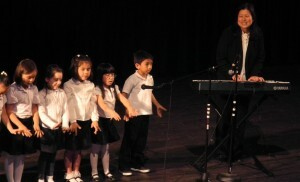 The JBBP Choir, under the direction of Kaori Nakano, at a previous Day of Remembrance program. Fifth-graders from the Japanese Bilingual Bicultural Program at Rosa Parks Elementary School will perform. The program will also include film clips, a candle-lighting ceremony and a procession led by the Japanese American Religious Federation. A reception will follow at the Japanese Cultural and Community Center of Northern California, 1840 Sutter St. (near Webster). Admission is free, but registration is requested. Call (415) 921-5007 or visit www.dayofremembrance.org. Following is a statement from the organizers. “Over the last three decades, in communities throughout California and major cities nationwide, Day of Remembrance (DOR) has been commemorated on or near Feb. 19, when, in 1942, President Franklin Delano Roosevelt signed Executive Order 9066, setting into motion the exclusion, eviction, and incarceration of 120,000 persons of Japanese ancestry, both citizens and immigrants. “DOR events, along with the pilgrimages to former concentration camps and, on a national scale, the Commission of Wartime Relocation and Internment of Civilians (CWRIC) public hearings in 1981, played a key role in uniting the Japanese American community around the redress and reparations movement. These events and experiences brought the story to broader audiences and popularized the call for an official governmental apology, individual redress, and a community/public education fund, for the ultimate purpose of preventing a similar injustice from happening again. “Increasingly, as we witness similar tragedies taking place throughout the world, the Bay Area Day of Remembrance events have evolved into a unique opportunity for Nikkei to join with diverse communities to reaffirm our common belief in the importance of civil and human rights and to remind us of our collective ability to act upon that belief. “This year we are dedicating our program to the memory of Sen. Daniel K. Inouye, who was officially the senior senator from Hawaii, but was in fact and actions the senator representing Japanese Americans and many other minority groups in the U.S. From his service in the 442nd in World War II, where he rose from a buck private to a battlefield commission to captain, to the Hawaii Legislature, to congressman, and finally to senator, Daniel Inouye was a remarkable man who amassed a remarkable record.